Some deaf athletes and spectators felt like second-class citizens at the 2012 Paralympics, says the former president of the International Committee of Sports for the Deaf. Craig Crowley told BBC Sportshour that change is needed for deaf athletes to get more recognition and funding. But an International Paralympic Committee (IPC) spokesman said: "We refute any allegation." To qualify for the games, athletes must have a hearing loss of at least 55 db in their "better ear". The ICSD split from the IPC in 1995 to protect its separate cultural identity. Crowley, who was ICSD president until 2013, said: "I was invited to both the Olympics and Paralympics in 2012 and I could see the efforts that both organisations had made to improve communication and accessibility, but I would have to say they were not offered on a full basis. "I received a lot of feedback that deaf athletes taking part in those Paralympics and spectators felt they were treated like second-class citizens." 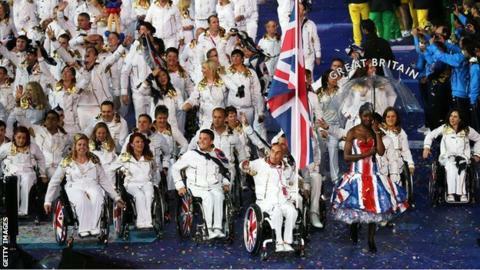 However, the IPC insisted that London 2012 embraced all athletes and spectators and denied Crowley's criticism. An statement read: "Post-Games research from London 2012 has shown that they were the most accessible and inclusive Paralympic Games ever, a view shared by athletes, spectators, media and the the London Organising Committee of the Olympic and Paralympic games (Locog) workforce. "As with any event there is always room for improvement. However, it must be stressed that absolutely no concerns were expressed to the IPC from deaf athletes or spectators before, during or after London 2012. "Therefore, we refute any allegation that deaf athletes or spectators were made to feel like second-class citizens at the best Paralympic Games ever." There are 20 sports at the summer Deaflympics - athletics, badminton, basketball, beach volleyball, bowling, road cycling, football, handball, judo, karate, mountain bike, orienteering, shooting, swimming, table tennis, taekwondo, tennis, volleyball, freestyle wrestling and Greco-Roman wrestling. Crowley's comments come in the week that the venue for the 2015 Winter Deaflympics was confirmed. The Russian town of Khanty-Mansiysk will host the 18th version of the games between 27 February and 7 March 2015. The Deaflympics are the longest running multi-sport event excluding the Olympics and were also the first international sporting event for athletes with a disability. Athletes must have a hearing loss of at least 55 db in their 'better ear' to compete. Hearing aids, cochlear implants and the like are not allowed to be used in competition, to place all athletes on the same level. Although the International Olympic Committee recognises the Deaflympics on a par with the Paralympics, the GB Deaflympics squad, who won five medals at the 2013 summer games in Sofia, operates on a lower budget to the British Paralympic team. Crowley added: "It's about equality through sign language and other forms of communication, also accessibility, translation services, interpreting. "All of these things haven't happened in the Paralympic movement, but with our own games they have. "That's why we need to maintain the Deaflympics ideal and work together to advance that. "The IPC has gotten on a particular track and we need to get back on that with them very quickly. It would be a crying shame if that opportunity is missed."